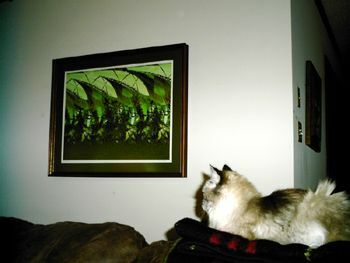 A framed print of To the Joust. My cat studies its intricacies for hours. I’d like to talk about my experience with making prints. Let me begin by making clear that I’m not claiming to be any kind of expert in this area. There are plenty of professionals who know more about the ins and outs of printmaking than I. So, to show good faith, I’ll provide some links to a few more learned people at the end of this post. My purpose in writing about making prints is simply to give an account of my own experience — and to try explaining why the decision to make prints has re-shaped the way that I see and create art. What first set my dials to printmaking? Thinking about presentation methods was the initial baby step — and then beginning to explore various ways in which fractal/digital art could be showcased. All artists (with a capital A) have multiple means of presentation. A musician’s song can be recorded, played live, played “unplugged,” be utilized as background music in a film, be transformed into a visual narrative using video, and so on. Likewise, a poem has similar possibilities for being displayed — read privately, read aloud, performed, slammed, audio recorded, video recorded, inserted into multi-media, and so forth. Fractal/digital art is no different. Such art can be viewed on a home monitor, be uploaded to a Fractalbook repository to take its place amidst the socializing and tabulating, be printed (on either paper or canvas) and hung in a home-business-museum, be displayed digitally on a hi-def, large-screen state-of-the-art television, be printed in a book, shared as a par file, reduced to a navigational thumbnail, and — as we’ve seen from past OT posts about Phase Two thinking — be sculpted or painted or blown or constructed or imprinted on t-shirts, mugs, balloons, frisbees, and thongs. The paradigm shift for me occurred when I made a conscious decision to present my work offline as well as online. The first thing I vowed to do was to take presentation seriously — as seriously as I do my own art. I began to research and quickly discovered that to make decent prints I’d have to render images at much larger sizes — and so I did. I found it was not too difficult to render fractals at larger sizes, at least in the fractal software I use, but the extensive post-processing I commonly do could be a problem. I began to experiment pushing the size constraints of my “studio” to discover the comfort boundaries of the computer I use to make art. Each time I can afford to build a new machine, I try to make sure it packs affordable maximum firepower to enable me to work larger and faster. I first stepped up to images sized at 1800 x 1200 pixels, and now I can work and post-process at the notorious BMFAC-required sizes of 8000 x 8000. But not quickly. Everything slows down considerably once you go large. Render times drag. Working in graphic programs like Photoshop take patience and medication/meditation when effects and adjustments slow to a snail’s crawl. One side effect, although not necessarily a bad one, is that the time lag corresponds to less output. I probably (mercifully?) now produce 1/4th the amount of work than I did in the same time frame when I first discovered fractals. Although I hope I’m more discerning about the work I now make public, it’s also true that it takes me substantially longer to finish individual pieces. There is another side effect. My canvas is now six to eight times larger than it used to be — and, consequently, I’ve become much more particular about how that space is filled. Artistic concerns — like texture, balance, highlights, dominance, unity, overall composition, and (especially) perspective — become more integral (and more time-consuming) in the process of shaping and finishing a given work. In fact, in previous OT posts I’ve described the effect of increasing the digital canvas as a significant mental shift moving from perceiving work in “monitor mode” to perceiving work in “wall mode.” In other words, all through the composing process, I envision a work displayed large (wall mode) rather than small (monitor mode). Once I made the conversion to wall mode, I then began searching for a professional Printer (I’m using the capital “P” to designate a person and not a machine). Finding a good one turned out to be a difficult, hit-and-miss journey. I’ve had no experience with places like Zazzle or the printing services provided on some Fractalbook sites like deviantART, but my experiences with online printing sites were frustrating. The prints just looked funky — colors appeared over- or under-saturated, depth seemed washed out, and one image even came back exploded and reassembled as a neo-cubist collage. Even several local print shops could not reproduce images to my satisfaction, although the turnaround time improved. Finally, one afternoon, I saw a series of prints of nature photographs in a local museum. The prints were breathtaking — exhibiting a clear sense of depth and a stunning clarity. I called the artist for information, and he told me that he did the prints himself, and that he ran a print shop as a commercial venture. I asked if he’d work with me, and he agreed — mostly, I think, because he’d previously worked exclusively with photographers, and he wanted to get some hands-on experience printing original, “pure” (his term) digital art. I believe having a proficient, trusted Printer — one with an artistic eye — can make a noticeable difference in the quality of prints. My Printer is exacting and takes pride in his work — making small test prints to see if color and resolution look right, or trying trial runs on various grades of paper to better obtain an ideal reproduction. Again, taking your printing endeavor seriously is non-negotiable. I insist on using the highest quality, archival inks and papers to try to produce professional Giclée (ink-jet) fine art prints. I was fortunate to find a Printer who is also an artist — and one capable of skillfully pulling off the sizable magic trick of bringing a digital image into the physical world. You also have a decision to make at this point. Should you use paper or canvas for a background? In general, paper is the preferred choice for making archival, museum-quality, Giclée fine art prints. Paper prints are de rigour for galleries and collectors, but they also come with their own set of problems. They are delicate and can be easily damaged. Smudging and sun-fading can occur, and liquids are their mortal enemy. So, paper prints must be matted and framed under glass to keep them safe — and, depending on the size of the print, the glass and frame can quickly become quite heavy. Your other option is to print on canvas — although such prints seem to be less desirable for collectors and regarded by museums to be near-gauche. Canvas prints, not surprisingly, are much more like a painting and are even stretched and mounted on a wooden frame — which means even large canvas prints are considerably lighter than small glass-enclosed paper prints. Canvas prints, especially if covered with a protective lacquer, are certainly much more durable. To my eyes, canvas prints tend to flatten out an image and degrade texture, but they retain more color richness and hue. Paper prints, on the other hand, tend to lose bright colors a bit, or start to develop watercolor-like traits if the paper isn’t well suited, but they preserve both texture and depth far better. In a good paper Giclée, textured forms can become visibly embossed and take on distinctive 3-D qualities. So, now you’ve worked large and made your print — what next? Admit, as a digital artist, you are working with a generally agreed upon disadvantage. You have no original — no concrete, tangible masterwork — no unique physical object, like a painting or sculpture, that can be shown or sold. A painter, too, can make high-quality fine art prints — but she or he also possesses the original painting — the mold from which copies, even Giclée prints, can be made. Naturally, as a fractal/digital artist, you also have a master, as does, say, a digital photographer. But such masters cannot function in the same ways as do paintings or sculptures. (Or can they? More on that later.) Therefore, facing such an inherent shortcoming, how can you try to insure that your prints will have value? You limit the number you make. From what I can tell, practices on limited-edition prints vary widely. You’ll have to decide what idiosyncratic approach and commercial specifics best serve your needs. What I eventually settled on doing was limiting each image of mine to a Variant Edition (V.E.) of 25 prints of any type or size. That means only 25 prints — large or small, canvas or paper — will be made of any given image. Once the 25th print of an image is made, I ask my Printer to delete the “master” file of that image from his computer. I also allow making up to 2 “artist’s proofs” per image — that is, running off a small number of prints for the artist’s use that are set aside from the edition prints. Artist’s proofs, because they are more scarce, tend to be more valuable. To further insure the legitimacy of the print edition, I sign, number, and date each print — and, of course, keep records of the printing history of each image. I also provide a “certificate of authenticity” to be included with each print. These are made using my production company stationary and include background information on the print — title, year it was made, edition number, Printer info, Framer info (if applicable), ink and paper stock information, caring for the print notes, process/composition notes, and background notes (when appropriate). Some artists go further and take the step of having their print certificates notarized to further bolster authenticity. I even saw one artist display and discuss his prints while wearing white gloves. That might seem like overkill, but the gloves made an impression that stuck with me. It was obvious he considered his work to be valuable and acted accordingly. I stress again, there’s no point in undertaking making prints unless you do so in a professional and earnest manner. I have a challenge for you. Work on an image you want to print. From the start, make it larger than you usually would. Reflect carefully about texture. And perspective — squint at the image with your nose to the monitor, then stand across the room and see how it looks in complete darkness. Take your time until you are satisfied with every detail. You aren’t making this image for a desktop background. You aren’t making this image to upload to a social networking site. You’re making this image for a physical space in your home. When it’s done, print it. Print it — seriously. Seriously — as in not at home on your PC’s HP deskjet or whatever. No, take it to a shop. Print it at a larger size than your home printer can handle. Choose paper carefully. Use archival materials, if available. Title, date, and sign your print using a graphite pencil. In fact, make it an “artist’s proof” (it is, after all, isn’t it?). Then, frame it — seriously. At a minimum, buy a frame set that includes glass and a functional matte. Better yet, have your print professionally framed. Carefully choose the frame and style and color of matte. Take your matted and framed print home. Find a suitable space. Hang it. Let it be. For at least a month or two. And see what happens. See if you don’t develop a different relationship with your image — or come too see it in a new way. Does it fill space in a manner unlike viewing it on your monitor? Do the other surroundings in the room help determine its effect or shape its meaning? Do guests or family members react to it? Take my challenge and see if changing the way your work is presented changes the way it is perceived — by you and by others. Here’s an interesting conversation from MOCA on “Printmaking: Traditions and New Trends” between Professors John Antoine Labadie and Ralph Lee Steeds of the faculty of the University of North Carolina at Pembroke. About.com has articles defining Giclée prints, explaining how they are made, and advice on how to sell art prints. Wikipedia on Giclée prints. Authoritative as written by who knows who can be. There are, of course, numerous books you can buy on this general subject — like Mastering Digital Printing by Harald Johnson and (for those with Phase Two leanings) Digital Art Studio: Techniques for Combining Inkjet Printing with Traditional Art Materials by Karin Schminke et. al. And, yes, I know what some of you are thinking. I can hear you clearly across the vastness of cyberspace. Fractal art is a digital medium. It’s an art of light and code. It is best presented and viewed digitally. If it’s not, so much is lost. Colors dry up. Depth is scuttled. Distinctive elements, like lighting features, evaporate when placed outside a digital environment. Moreover, there’s no quarter given on this point of view. Intrinsically, it’s a disservice not to display and view fractal art in a digital milieu. Well, I agree. Digital art does become something else removed from digital space and reconstituted in physical space. But, remember, I’m not advocating one presentational method is preferable to another. I’m only pointing out that there are various avenues from which to present one’s work. Each has advantages and disadvantages. Frankly, I think the future looks promising for digital purists. That’s probably because I had another eye-opening experience recently. I took the master copy of one of my images, burned it to a DVD, and carted it over to a friend’s house in order to view it on a high-def, 65 inch, flat screen TV. And, yes, its pixels jumped and buzzed in a visceral way that no print I’ve ever made could match. So, don’t lose hope, digital true believers. The days of Total Recall, wall-sized, high-definition, digital screens or “frames” are not science fiction. I think museums and collectors will soon have to come to terms with the imperative of sometimes presenting digital/fractal art in digital space. They’ll feel compelled to invest in high-end screens and to meticulously set the ambiance for an optimal viewing experience. I only have one caveat for digital experience enthusiasts. Be consistently serious. Treat each image of yours as an individual work — a work deserving its own screen/frame. If you’re thinking of just sticking a flash memory card into a digital frame and rotating through 1000 of your images with overly busy wipes and squiggle special effects, you’ve already cheapened yourself as an artist by settling for a screensaver on steroids. Worse, by suggesting that your work is obviously disposable and replaceable — a Fractalbook mindset that implies today’s mass-produced “masterpiece” is as awesome as yesterday’s — you lost the war being fought to present your work as fine art. In the end, after your many labors and tears, doesn’t your vision deserve better than a hokey digital billboard? I’m so glad you wrote this…honestly and with no bull. I have been thinking for a while about the way my fractals are presented, and I want them printed. In fact I am also an amateur paper-maker and have decided that as well as “proper” prints I want to experiment with my “other” craftwork and fuse the old and the new. I dont have a wonderful printer, just your normal everyday inkjet, but I did print out one of my favourite fractals onto handmade paper just to see how the image translated. It immediately took on a new life, from bright purples and an obvious fractal feel to an antiquarian feel..the colours were less crisp (printed on smooth paper they retain their original colours)as they merged with the fibres. When the artwork (or craftwork if you will) is translated into another more physical form you are right, it has to be looked at in a different way. And I love it. I will be experimenting with more of my handmade prints only because funds dont stretch to professional printing. I may even make some limited edition prints on my own paper just to see if they sell. Terry, you have written a very good article, and well thought out. Hopefully many will read this and take heed to your insight. 1) When working on a fractal (or generally on a digital image), try to imagine it as a printed picture, rather than a virtual one. This may help you to understand and foresee the problems that you could encounter at printing stage. 2) Work on large images! Large means not less than 3000 x 3000 pixels… My images are usually sized at 6000-8000 pixels. 3) It is well known that screen images are brighter and more contrasted than their printed version but also expect to encounter problems with the conversion from RGB to CMYK. Screens shows images in the RGB color space, whereas printers are based on CMYK: the latter is somewhat narrower than the former and some brilliant colors seen on screen simply cannot be printed! I love Stephen Ferguson’s programs (Tierazon, Sterling, etc. and they usually generate brilliant, unique colors!). This is a nasty problem, which cannot be disregarded. So, accept it and try to obtain the best using a good photo editor to prepare a CMYK version. I generally do not apply important post-processing to my fractal images, but a careful manipulation of colors, brightness and contrast is often unavoidable when preparing a printing version. Eventually, the new version could turn out to be rather different, chromatically, from the original one but you will like it. Otherwise, give up and leave your fractal in the virtual world only! 5) At each stage (from fractal generation to printing) require the best!